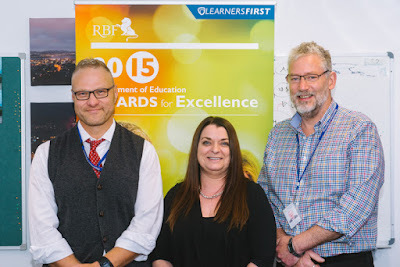 The Jordan River Learning Federation of East Derwent Primary, Gagebrook Primary, Herdsmans Cove Primary and the JRLF Senior Schools has been in place for four years. These schools’ principals,Teresa Pockett, Della Wells, Carolyn Brown and Robyn Storey, work together as a team to capitalise on opportunities for partnerships, networking and information sharing. Despite challenging circumstances, they have worked tirelessly to lead their staff to improve student learning outcomes and there is clear evidence of the outstanding results these four principals are accomplishing. 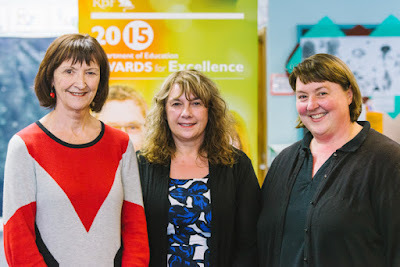 The JRLF principal team have focused on ensuring the conditions for learning are evident in their schools.They are aware that a safe, calm, orderly environment is paramount to maximising student learning with a focus on Respectful Schools, Respectful Behaviour. 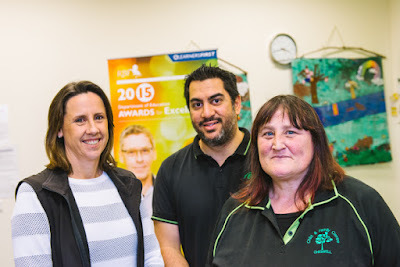 Their combined passion and commitment to the students in their care is unsurpassed. The Chigwell Child and Family Centre is led by an inspirational team focused on giving children the best possible start in life by supporting their families to access quality services in the local community. M’Lynda Stubbs and Chris Mason are focused on enabling families to be confident and capable in nurturing their children.They have created an environment where diversity is valued and being part of a community is celebrated. Each family is welcomed in a genuine and friendly manner and the sense of belonging, trust and rapport is quickly established. They demonstrate an absolute commitment to meeting the changing needs of the community. They ask rather than assume, and genuinely seek to understand. The team at the Chigwell Child and Family Centre are inspirational in their commitment to equity and excellence, ensuring that they support families with respect to provide bright beginnings for their children. ITS Managers Scott Ashton, Kris Klasen, Lisa Baker, Phil Dilger undertook a major refocus of the IT Helpdesk to improve service delivery in a tight three-month period in addition to their day-to-day project and support work. The IT Helpdesk was enhanced with new services and additional resources to increase service provision, as well as enabling the end-user to self-help themselves with FAQs, help documents, videos, web resources and a new web portal. The four managers scoped the work required to move to a new model and allocated the work across each of them.With each Manager having different tasks they worked with other ITS staff to obtain input to ensure the new IT Helpdesk would meet user needs. The success in delivering the project was a shared focus on improving client services, a strong team dynamic of shared responsibility and the collaborative nature in the way they worked together.